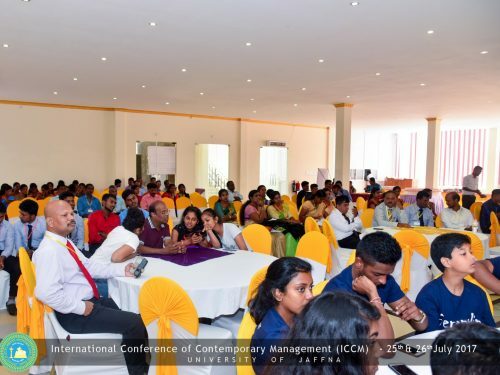 The Faculty of Management Studies and Commerce of the University of Jaffna joining with its Alumni Association conducted its fourth ICCM on June 25th & 26th, 2017 at Hotel Green Grass, Jaffna. With a focus on the sustainable challenges of Business community and of the research literatures, theme of the conference was “Inspiring Pledge for Sustainability over challenges”. 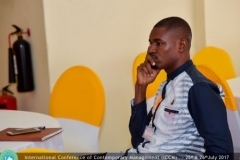 It brought together the newest developments in new management practices, business ideas, entrepreneurial solutions, and academic research results. 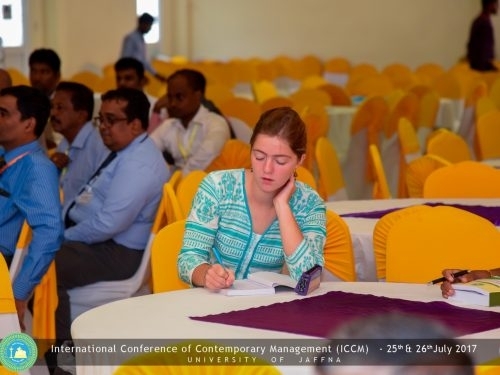 The conference had been designed to provide sufficient opportunities to researchers to create network and to share ideas and information about the business solution for sustainable business. 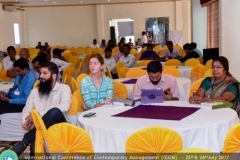 The conference addressed a variety of topics relevant to the main theme, including specific questions about the sustainable strategy at large, such as Accounting & Finance, Banking & Insurance, Business and Legal Environment, Business Information System and Design, Contemporary Issues in Entrepreneurship, Culture &Ethics, Economics & Social Practices, Project Management &Innovation, Health Management, HRM & Organizational Behavior, International Trade &Finance, , Knowledge Management, Marketing & Supply chain Management, Operations research , Paradigm shift in research Methodologies, Regional and District level challenges, Regional & Community planning, strategic Management, sustainable strategies for Small Medium Enterprises, Tourism , Hospitality and Event Management , and Urban Management. 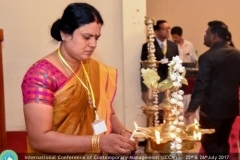 Prof. T.Velnampy, Dean, Faculty of Management Studies & Commerce , headed as the Conference chair, Dr.Mrs.S.Shanmugathas; Senior Lecturer ; Department of Marketing as the Convener , Heads of the Departments; Prof.B.Nimalathasan, Dr.R.Yogendrarajah, Mrs.T.Raveendran, Mr.M.Karunanithy, and Mr.B.Prahalathan as Co-Chairs , action Committee members Dr.(Ms).L.Kengatharan, Mr.L.Mayuran, Dr.P.Piratheepkanth,and Mr.S.Achchuthan by way of a crew harmonized the event as a joint effort. 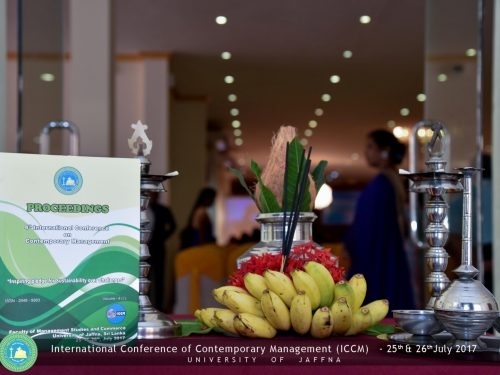 The committee of ICCM 2017 had received 216 abstracts, and 133 full papers. 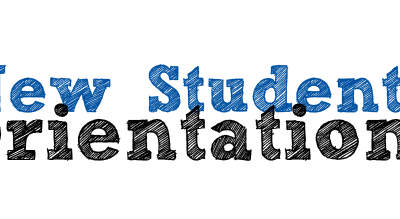 Two blinded reviews for each paper were done by the expert academicians. Accepted papers were sent to the authors aimed at comments for corrections. 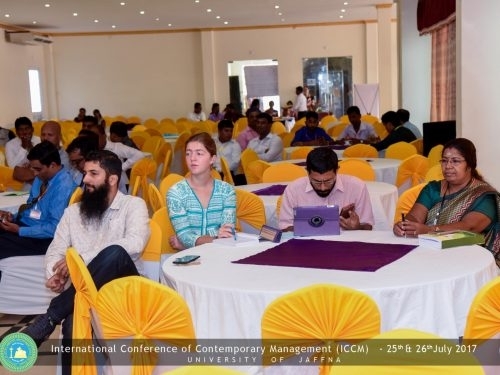 ICCM 2017 ensured that the papers included the corrections suggested by the reviewers. 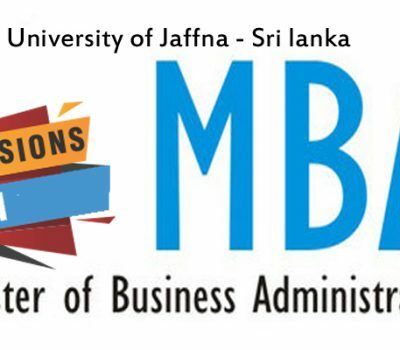 It is an inordinate desire that it recognized 96 research papers for sharing knowledge among the academicians as well as Practitioners and the Community, and selected papers were published in the ICCM 2017: Proceedings and the Faculty Journals; International Journal of Accounting & Finance, and Journal of Business Studies. 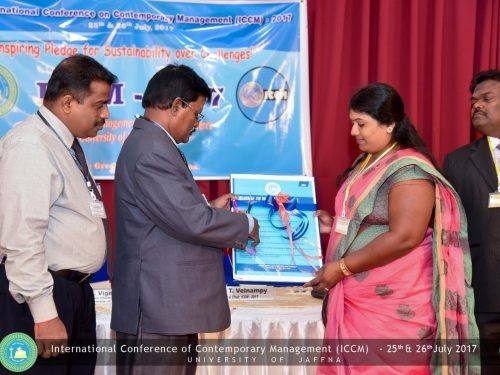 ICCM-2017 acknowledged priceless involvement of the reviewers who reviewed abstracts and full papers within the very short timeline. All academic, Nonacademic, and academic supportive staff, who devoted their time and effort in a team exertion to make this conference as a victory occurrence. 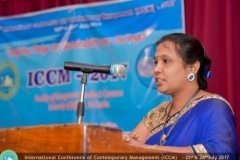 The ICCM 2017 promoted a reflection on the role of research integrity in the structure of contemporary Management, addressed research practices of publication system, current ethical challenges in peer review and its consequences regarding the reliability of the research record, and coordinated effort of academic and nonacademic, and other support staff. 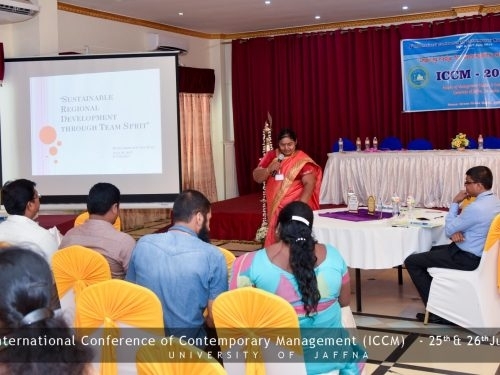 In an effort to capture all knowledge that continues to generate in the field of Contemporary Management, this conference recorded numbers of presentations, divided into 17 parallel sessions with 06 guest speeches. 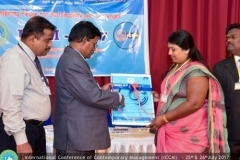 The conference provided a space for knowledge sharing through 80 papers presented by the researchers and academics including 02 poster presentations. 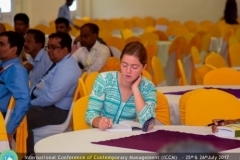 There are around 400 national and international scholars showed their interest in participating in the conference. 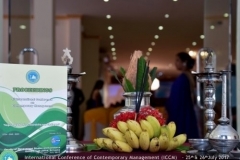 The schedule of the ICCM 2017, was quite busy, with an extensive two-day program, with inaugural Plenary Session, technical sessions, Guest speeches, Panel discussion, cultural event, livelihood exhibition and valedictory session. 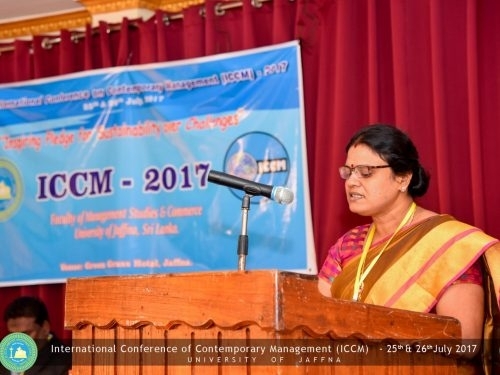 The Inaugural Plenary Session of ICCM-2017 was undeniably an industrious and electrifying session by the distinguished participation of academic community. 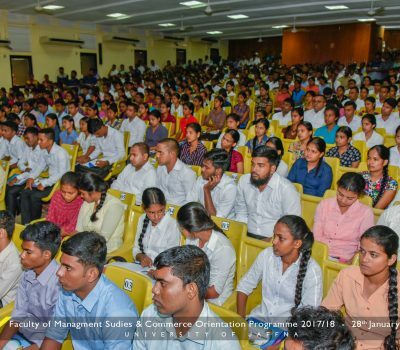 Professor R.Vigneshwaran Vice-Chancellor, University of Jaffna as the Chief-Guest, and Dr. T. Mangaleswaran, Rector, Vavuniya Campus as the Special Guests were invited. 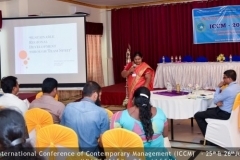 Besides, two key note speeches were delivered on “Business success and sustaining strategy in Global Market” by Prof.K.Maran, Sairam Institute of Management Studies, India and the other on “Sustainable growth and Development amidst uncertain global environment “ by Dr.Sujeetha Jegajeevan , Senior Economist, at Central Bank of Sri Lanka. Guest speakers from business and community development field were invited as visitor speakers at each Technical session. 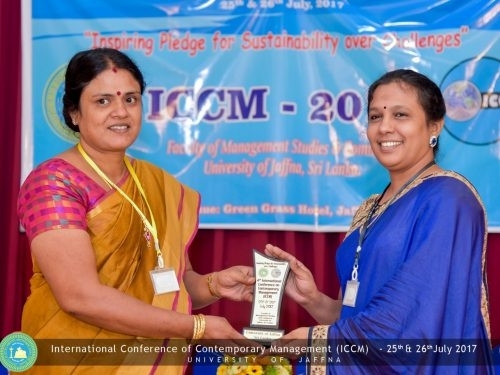 ICCM 2017 had inspired them for their long-lasting services in community work. 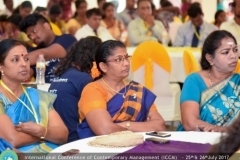 Trisha T.Selvaratnam (Charted Accountant, Chairperson of Serendip Children Home-UK); Joy Rose Ganesswaran (Zonal Economic and Agriculture Specialist); Fumi Ito (Project Coordinator PARCIC); Mr.K.VIgnesh (CEO, IIS, City Campus ); S.Thushyanthy (Marketing Coordinator Sari connection Project, PARCIC);Prof.N.Shanmugalingam( Former Vice Chancellor , University of Jaffna) delivered inspirational speeches at the different tracks as Accounting and Finance, organizational Development and Human Resource Management, Marketing and Supply Chain, , organizational development and Human resource Management, Marketing & Supply Chain and Tamil respectively. 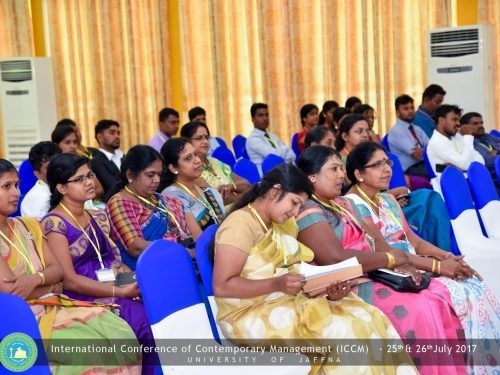 Being a culturally diverse group of academic participants, on the first day of the conference, venue for cultural dinner was fully packed, and it was a great opportunity for a social interaction and networking among participants, staff and their families. 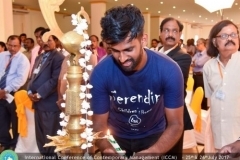 Fineness dance was performed by the students of Ramanathan Academy of Fine Arts, and other twelve events such as dramas, musical programs, balls, funniness events, performed by the students of the Faculty of Management Studies and Commerce. 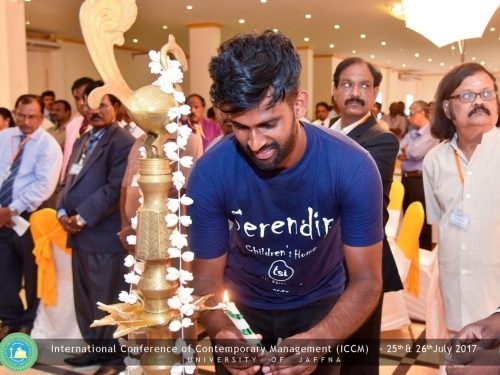 29 Students emanated for voluntary works from Serendib Children home (UK), participated at the ICCM 2017, and they shared their knowledge and also they started a social interaction network with students of the Faculty of Management Studies and Commerce. It was a rewarding experience to meet such a diverse mix of researches from around the world. 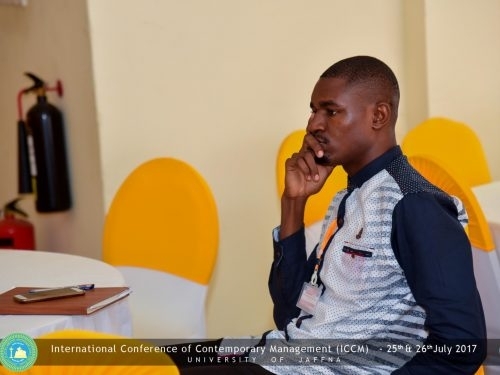 Interacting with the truly international cohort at the conference provided them with a global outlook on contemporary management, as we heard about the different challenges they pose in every corner of the world. 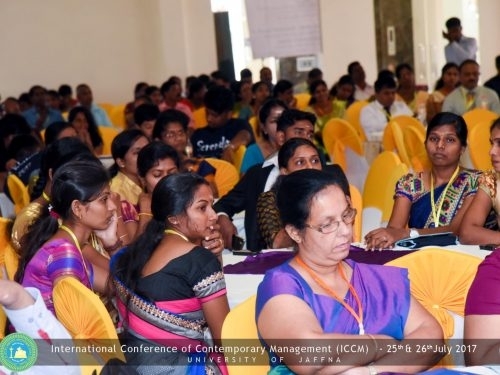 On the second day, in addition to the technical sessions a panel discussion was organized on the theme” Role of Universities in the Process of Social Transformation” Prof.G.Kannapiran National Institute of Technology, Trichy, India played major role as moderator of panel discussion of ICCM-2017. 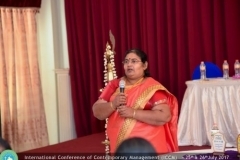 The following academicians participated as speakers on sub-themes. 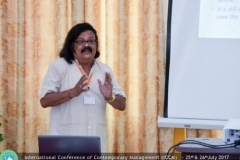 Learning and Teaching: Prof. V.HemathKumar, SAIRAM Institute of Management Studies, India. 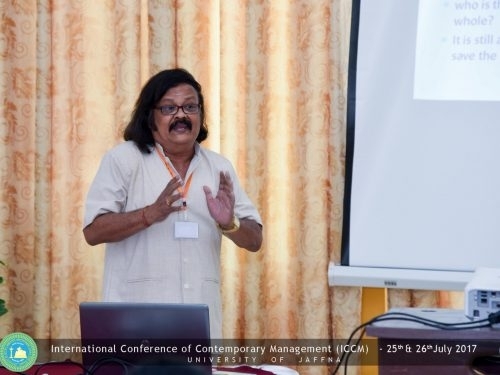 Researches and Publications: Prof.G.Migunthan: Dean, Faculty of Graduate Studies, And University of Jaffna. 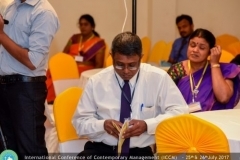 Creativity, Innovation &Communication: Prof.T.Atputharajah, Dean, Faculty of Engineering/ University of Jaffna. 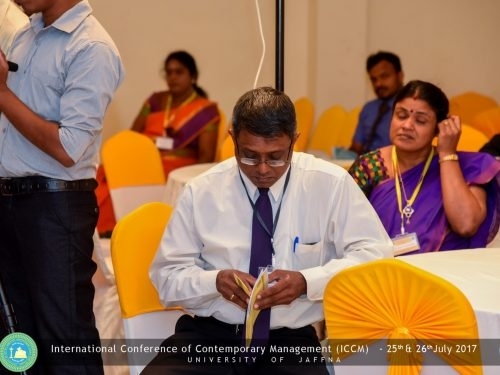 Community Engagement: Dr.N.Surendrakumaran, Dean, Community Medicine, University of Jaffna. 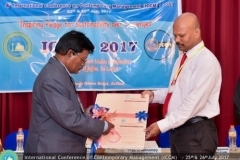 ICCM -2017 also supported activities to strengthen contemporary management practices of community based organizations. 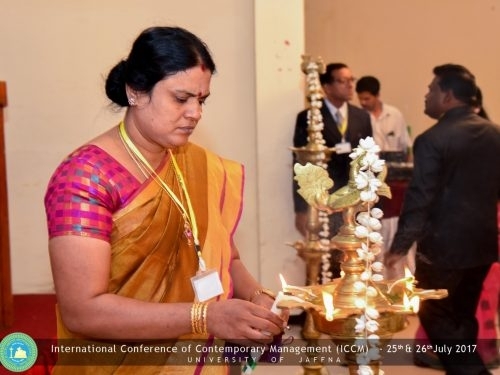 ‘PARCIC’; A Japan NGO, which collects Used sarees, recycles as input material for making clothes to sell in international market for tourist segment. It is a livelihood project to support war affected women in North. 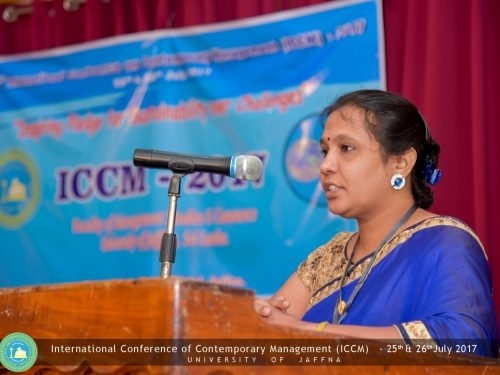 ICCM 2017 invited ‘Saree connection’ to exhibit them to the international scholars at the conference. 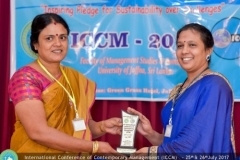 It inspired the beneficiaries of Saree connection project via arranging a stance for sustainable strategies for recycling project. 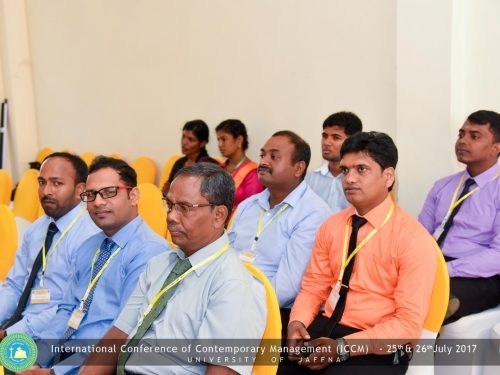 ICCM-2017 received generous support from the sponsors as People’s Bank, Bank of Ceylon, Cargills, Blue ocean group of companies, and other well-wishers. Before wrapping up the conference, we had the valedictory session. 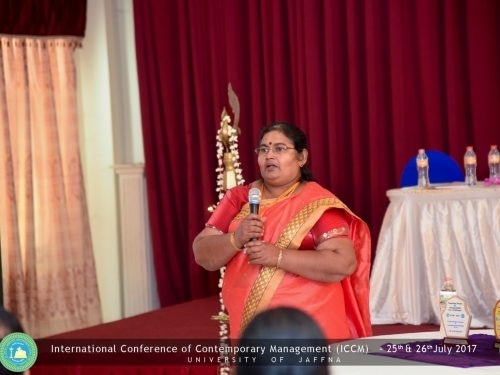 Dr.J.M.Arul kamaraj, Assistant Professor, Department of Social Work, Loyola College, Chennai, Tamil Nadu voiced the valedictory address ,Mr.S.Rajakumaran, University of Jaffna Prof.K.Maran, SAIRAM Institute of Management Studies, India ,Dr.J.M.K,.Kennedy ,Madda Walabu University, Ethiopia, made conference assessment addresses . During this time number of representatives from the audience came forward and gave their feedback also. 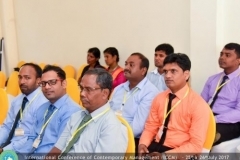 The effort of the faculty was very success and appreciated by all who participated in the session. 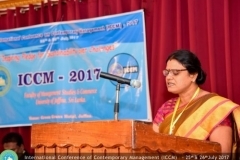 Staff of the Faculty witnessed great team effort in the vast association of ICCM-2017 with copious support from the Vice Chancellor, Dean of the Faculty and Heads of the Department, Convener , Action committee , Correspondence committee, All Event-Team members and the student volunteers made the ICCM-2017 a memorable event. 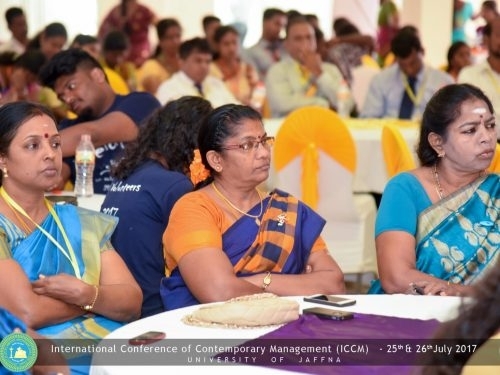 At this juncture ICCM-2017 would congratulate all supporters, and invite the Event-team ICCM 2018, and wish them for the great success at the succeeding conference. நுண்நிதி டிப்ளோமா 2ம் அரையாண்டுப் பரீட்சைக்கான விண்ணப்பம் கோரல் மற்றும் பரீட்சை அட்டவணை.